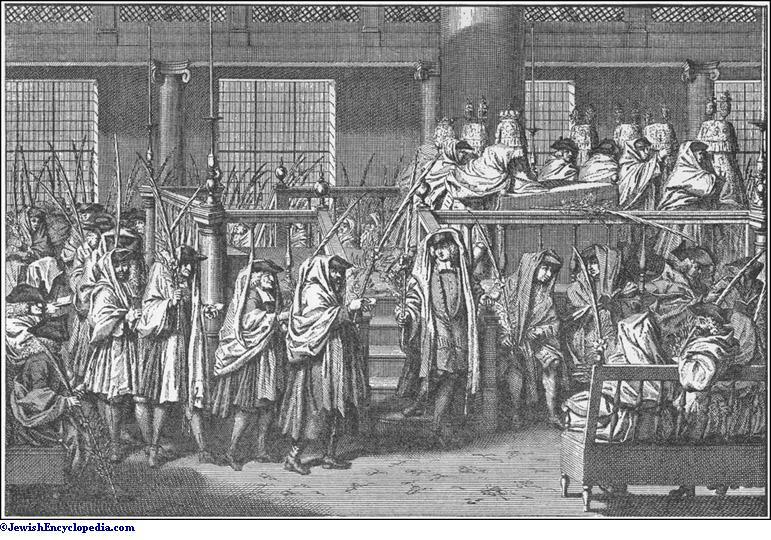 The popular name for the seventh day of the Feast of Booths (Sukkot); the day on which the exclamation "Hosha'na!" (save now!) is often repeated, while on the other days of the feast it is used but sparingly. While the name arose comparatively late, the character of the day as distinguished from the rest of the feast dates back to the days of the Temple, probably to the first Hasmoneans or even earlier. The Gospels mention the word as the cheerful cry of men carrying palm-branches, but by a mistake place the custom in the season shortly before the Passover, instead of in the Feast of Booths. The Mishnah (Suk. iv. 5) mentions the processions around the altar during the feast, once each on six days, but seven times on the seventh day. It explains the "commandment of willows" thus: At a place below Jerusalem called Colonia willows were gathered—big branches, about eleven cubits long; these were set up at the sides of the altar with the foliage overhanging it. The willow is furthermore mentioned in Suk. iv. 1, 3 as being in use on six or seven days—six times when Sabbath fell other than on the seventh day of the feast, seven times when it fell on the seventh day. From this it would seem that the use of the willow on the seventh day was deemed of sufficient importance in the Temple service to justify its retention even on the Sabbath. 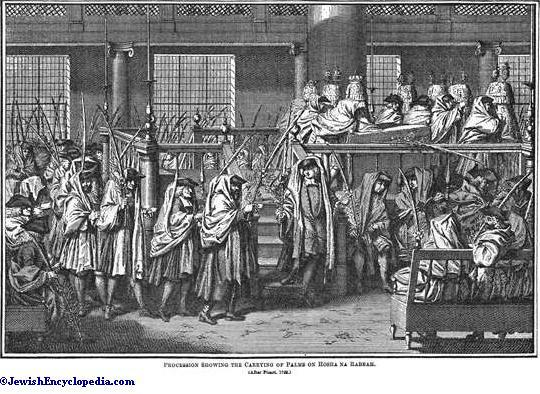 Procession Showing the Carrying of Palms on Hosha'na Rabbah. The joyousness of the Feast of Booths, as it gathered around the "drawing of water" and developed in music and torchlight processions (Suk. iv. 5), attained its height on the seventh day. Many of the exercises were in conflict with the Sabbath or even with a feast-day (Suk. 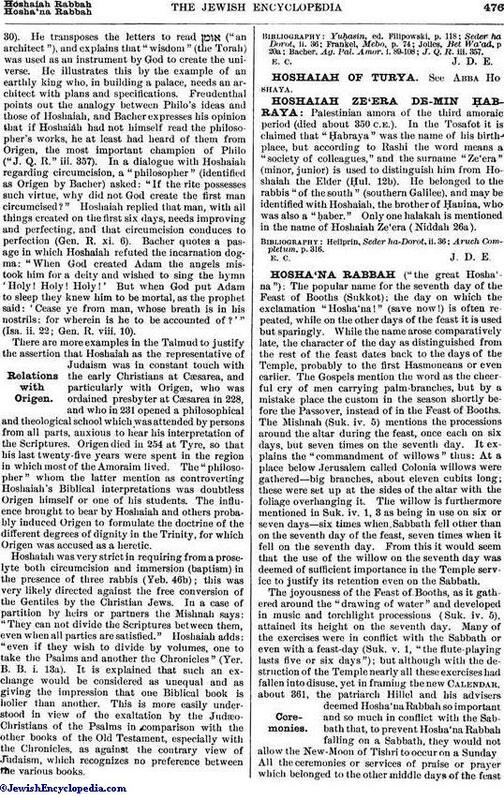 v. 1, "the flute-playing lasts five or six days"); but although with the destruction of the Temple nearly all these exercises had fallen into disuse, yet in framing the new Calendar, about 361, the patriarch Hillel and his advisers deemed Hosha'na Rabbah so important and so much in conflict with the Sabbath that, to prevent Hosha'na Rabbah falling on a Sabbath, they would not allow the New-Moon of Tishri to occur on a Sunday. All the ceremonies or services of praise or prayer which belonged to the other middle days of the feast while the Temple stood, or which belong to them now, such as Hallel and the swinging of the "lulab," or the sitting in the booth, belong also to Hosha'na Rabbah. The bunch of five willow-twigs in no way supersedes the two willow-twigs in the lulab. 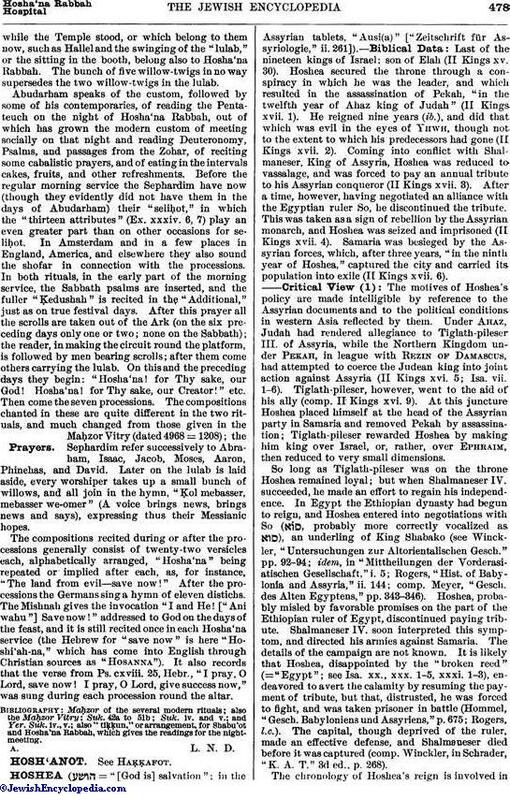 Abudarham speaks of the custom, followed by some of his contemporaries, of reading the Pentateuch on the night of Hosha'na Rabbah, out of which has grown the modern custom of meeting socially on that night and reading Deuteronomy, Psalms, and passages from the Zohar, of reciting some cabalistic prayers, and of eating in the intervals cakes, fruits, and other refreshments. Before the regular morning service the Sephardim have now (though they evidently did not have them in the days of Abudarham) their "seliḥot," in which the "thirteen attributes" (Ex. xxxiv. 6, 7) play an even greater part than on other occasions for seliḥot. In Amsterdam and in a few places in England, America, and elsewhere they also sound the shofar in connection with the processions. In both rituals, in the early part of the morning service, the Sabbath psalms are inserted, and the fuller "Ḳedushah" is recited in the "Additional," just as on true festival days. After this prayer all the scrolls are taken out of the Ark (on the six preceding days only one or two; none on the Sabbath); the reader, in making the circuit round the platform, is followed by men bearing scrolls; after them come others carrying the lulab. On this and the preceding days they begin: "Hosha'na! for Thy sake, our God! Hosha'na! for Thy sake, our Creator!" etc. Then come the seven processions. The compositions chanted in these are quite different in the two rituals, and much changed from those given in the Maḥzor Vitry (dated 4968 = 1208); the Sephardim refer successively to Abraham, Isaac, Jacob, Moses, Aaron, Phinehas, and David. Later on the lulab is laid aside, every worshiper takes up a small bunch of willows, and all join in the hymn, "Ḳol mebasser, mebasser we-omer" (A voice brings news, brings news and says), expressing thus their Messianic hopes. The compositions recited during or after the processions generally consist of twenty-two versicles each, alphabetically arranged, "Hosha'na" being repeated or implied after each, as, for instance, "The land from evil—save now!" After the processions the Germans sing a hymn of eleven distichs. The Mishnah gives the invocation "I and He! ["Ani wahu"] Save now!" addressed to God on the days of the feast, and it is still recited once in each Hosha'na service (the Hebrew for "save now" is here "Hoshi'ah-na," which has come into English through Christian sources as "Hosanna"). It also records that the verse from Ps. cxviii. 25, Hebr., "I pray, O Lord, save now! I pray, O Lord, give success now," was sung during each procession round the altar. also "tiḳḳun," or arrangement, for Shabu'ot and Hosha'na, Rabbah, which gives the readings for the nightmeeting.